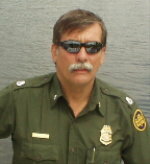 As promised in the Europe Police page here are some pictures of US Border Patrol. The USBP is the uniformed law enforcement branch of the Immigration and Naturalization Service and was formed in 1925 as the result of Mexican Bandit/Revoluntionary leader Pancho Villa's 1916 raid on Columbus NM, prior to thatt there were just 75 Mounted Immigration Inspectors who patrolled both the Mexican and Canadian borders. The US Immigration & Naturalization Service actually ceased to exist on March 1, 2003, and the US Border Patrol was then subordinated to the Bureau of Customs and Border Protection, in the US Department of Homeland Security. Other parts of the USINS went to the Bureau of Immigration and Customs Enforcement, and the Bureau of Citizenship and Immigration Services. thanks Dave, dident you post the size of the USBP over various years? Also would you happen to have a list of what agencies went into homeland security and which ones remained seperate?